Oakland Park residents lassoed an 8-foot alligator to a tree using an extension cord on Tuesday night before calling 911 to complain that the reptile had snuck into their swimming pool, the Broward Sheriff's Office said. OAKLAND PARK - Oakland Park residents lassoed an 8-foot alligator to a tree using an extension cord on Tuesday night before calling 911 to complain that the reptile had snuck into their swimming pool, the Broward Sheriff's Office said. By the time sheriff's deputies arrived at the River Oaks Apartments, 2929 N. Dixie Hwy., about 7 p.m., about 30 people were gathered around the unwanted pool guest, BSO spokesman Mike Jachles said. No one would admit to tying up the animal, which most likely came from a nearby canal, Jachles said. The apartments are just south of Oakland Park Boulevard. 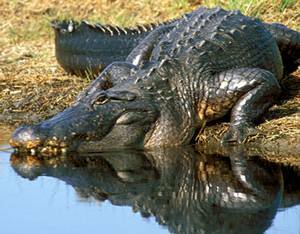 Police called a private trapper to remove the alligator, which had been thrashing around. The trapper told police the animal looked like it had been fed by humans. No one was hurt, but children allegedly threw stones at the alligator, he said. It wasn't the first time an alligator had crawled onto private property in Florida this summer. In June, one was found in the men's restroom of a Jacksonville restaurant after a rainstorm. OMG! not exactly your sweetest swimming instructor...thanks Raffi. wonder if they let it go? This would be scarey to find in a pool. Thanks Raffi. I THINK I'D PASS OUT LOL. HOPE THEY TOOK HIM BACK TO THE WILD. OAKLAND ISN'T KNOWN FOR GATORS. MY THOUGHT, ONCE AGAIN, SOME KID BOUGHT A BABY, THINKING HOW CUTE, THEN TURNED IT LOOSE AS IT BECAME A BIG UN'. I hope they humanely let him go back into his own kind of waters and glad nobody was hurt. Kinda scary though. Thanks Raffi for sharing. Mandi-this is Oakland Park, Florida-in Fort Lauderdale on the edge of the Everglades not California;-). If a trapper got him it's 50/50 that he got back to his habitat. I tried to find out of he was returned to the wild and I couldn't find any more on that. This article brought back memories to me of a time I went horsebackriding in Jupiter Florida as a kid and we were in the country by a little lake or pond or something. We were going to get in a rowboat and row the lake and then when we got in the boat we found it had a hole in the bottom. Suddenly the horses we had gotten off of started neighing and rearing and suddenly we realized that coming up behind us in the water was an alligator. I got a kick out of those people at Oakland Park lassoing the gator with an EXTENTION CORD and tying him to a tree-what a riot that must have been for the BSO to come to find...considering that the gator wouldn't have been intimidated by any extention cord if he wasn't somewhat domesticated, it seems, by people feeding him. And then they wonder why they find them in their swimming pools and gardens...and their pets missing.